The adder is the rarest of the reptiles found in Essex. It has a localised distribution within less of 50% of the county. It has not been recorded from North West Essex - any populations found here would be very local, and isolated. Adders are subjected to mitigation work which is generally used for lizards (slow-worms & viviparous lizard). However the different ecology of the adder (along with the grass snake) means that the usual bucket them and dump them approach (translocation) may be more problematic for adders. Anecdotal evidence suggests that slow-worms and lizards respond to translocation favourably while there is no data to support the effectiveness of translocation as a conservation tool (especially related to development). 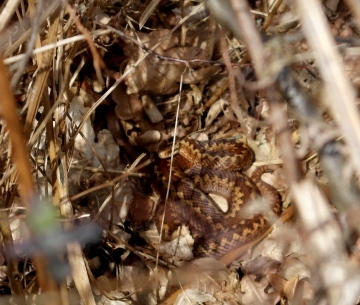 The adder is also sensitive to disturbance and habitat management can threaten populations as important habitat features such as hibernacula (scrub, sunny banks, etc) can be disturbed by habitat clearance for nature conservation purposes (e.g. heathland restoration). Spring time surveys are usually required to identify these important features to ensure the survival of the population. Timing habitat management work and including new habitats within management plans is vital for sustaining adder populations.